I have written about medications in the past. 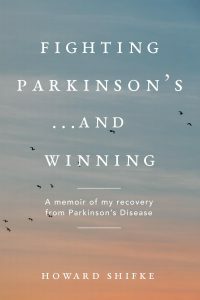 I have been delivering the same message since the first time I wrote about medications two and one-half years ago in Fighting Parkinson’s and medications. However, recent communications have made me feel that I need to clarify some things regarding medications. I have written in the past that for those on medications, please do not quit taking your medications cold turkey (all at once). I have expressed that nothing good would come from that. I have been asked to be clearer on what “nothing good” means. On two occasions when I have been contacted by somebody not doing the Recipe who wanted to discuss doing the Recipe, each of these people told me that on a prior occasion they quit taking Sinemet (Carbidopa/Levadopa) cold turkey and by the 5th day could no longer get out of a chair. Going back on their Sinemet got their movement back. For those on medications, you need to be taking your medications to have the physical capability to do the Recipe. After doing the Recipe for a while, people have expressed that they get a message from their body regarding their level of healing, and then, and only then, do they see it as safe to make a minor adjustment in their medication routine. The minor adjustment once in place does not fluctuate until such time that they have healed enough that their body gives them another signal that another adjustment is possible. Medication reduction is serious business. It is a body notification of healing that allows for minor adjustments…it is not a decision of the mind, and it is a slow and long process for those who are doing it successfully. Recently, it was reported to me that a person who was doing a medication reduction and having success made the mental decision to stop taking his final pill before his body told him it was ready. He had a bad reaction (body telling him it was not ready) and the doctors at the hospital put him back on his medications to get his movement back and temporarily-lost bodily functions functioning again. So, again, let me be really clear about this: Medication reduction is serious business and requires listening to your body at each step of the way to make certain your body is readily accepting the changes you make. This is how the ones who have been successful in completely eliminating their medications became successful. I do not post “how to” reduce or eliminate medications, nor do I allow comments that include instructions on “how to” accomplish this. That remains the same message as well. The twenty-seven people who I know have successfully eliminated medications have shown that it takes dedication, perseverance, daily doing of the Recipe (soul, mind, and body), amazing faith, a great attitude, and patience, patience, patience. Slow and safe requires patience. Slow and safe requires listening to your body. Slow and safe requires rejecting your mind trying to override your body when it comes to medication reduction. And, there are those who do not wish to reduce/eliminate medications, and that is okay, too. Three people who have contacted me let me know that they are doing my Recipe for the purpose of not having to increase their medications as they have no desire to decrease them, only a desire to not have to increase them. So far, so good, according to all three — none has had to increase their medications thus far. This is quite wonderful for them. Others in the middle of medication reductions have contacted me because they felt the messages from their bodies said to go back to the previous medication routine as the body was having an adverse reaction to the change. I consistently say to listen to your body and go back to where you feel comfortable and balanced. The choice of what to do is a choice in the moment, and listening to your body is the correct choice. If an adjustment to the medication routine is not working well and you go back to how it was, this is not a failure at all — this is only one choice in a lifetime of choices, no choice too big or too small, just the one you are making in the moment. And if you are following your heart and listening to your body, then the choice you make is the correct one in the moment. When I had Parkinson’s, I realized that I had been disrespectful to my body by ignoring months and months of physical notifications that something was really wrong with my physical being…pain, slowness, headaches, stiffness, fatigue, constipation, excessive urgent urination, loss of most of the use of my left arm, numbness in a portion of my face, hunched forward, shuffling…I let my mind talk me out of thinking anything was wrong. Then tremors…raging 24×7 tremors. My body finally got my attention before it was too late. I never disrespected my body’s messages again. I gave my body gratitude for keeping me alive, and I promised my body that I would do everything it asked me to do as well as the promise that I would not ask my body to do anything it did not want to do. You are Adrenaline-mind thinkers. Clearly, that was my downfall that opened the door for Parkinson’s to overtake me with symptoms. It is what will be your downfall on medication routine changes if you let your mind run the show instead of listening to your body. We have a beautiful, loving community here, and I just want to make certain that everybody remembers that if we labor along like the tortoise, good things will happen. Whether you are taking medications or not, patience is the way to go…slow and steady…and safe. What a valuable posting, Howard, thank you. If we didn’t need the meds no one would have started them in the first place. I am so grateful that I have enjoyed being as close to normal that the meds allow for 14 plus years. As I look forward to being totally free of the meds someday, today I am so grateful! my routine of fitting in an hour a day of the recipe when I can. I do notice some very small improvements especially in my general state of well being and my more peaceful mind and more optimistic outlook. Slowly slowly even these small changes feel like a huge step forward. Thank you once again Howard…. like Mayarita, I have never taken medications (even though first PD symptoms appeared in 2000 and my diagnosis in 2005)… so I am grateful that I don’t have the problem of reducing or getting off the meds. Still your reminder of care-full patience and listening to the body is very helpful. It reminds me how much I value self care….and self trust and self respect and self responsibility. Honoring those values helps to keep me on track …as does your consistent and generous support and that of our growing community. We are on an interesting journey. I’m trusting that, in tandem with your recipe for recovery, our collective experiences, perseverance and courage will help to pave the way for PD people in the future. thanx, all, for your encouragement and insight…..I have been weaning myself off the dose of sinemet I was taking in the middle of the night to help me sleep…..I am taking it very s-l-o-w….have been at it over a month….feeling more energy of late and better state of mind….expecting even bigger and better things ahead!….thanx to all of you this journey doesn’t seem quite so lonely…. This is great. I like the comments from everyone. I see that we are all progressing toward recovery in our own ways, which are varied. Sometimes on a down day im tempted to try but its good to have encouragement here from everyone to keep on course. Any tips on putting on weight with veggie diet? What timing! I have been super busy lately and realized I haven’t always been taking meds on time. Even though I have my phone programmed to go off when it is time. I fiddle around and sometimes it is late with no side effects. So, I have moved my med time 5 minutes later (talk about a turtle! ), but it is working just fine. When my body tells me, I will move it another 5. This is super exciting to me. Very exciting, indeed! Good strategy Pam. Progress is Progress! the same thing has happened to me , Pam. Once I stopped being mad at myself and feeling fear for not taking my meds on time , then I could listen to my body , now go 5 hours some times without meds. after taking them for 13 years this feels like a small miracle . Love and hugs to all of you, the blogs are so important to me. Thank you for your constant inspirations that are always so timely and helpful. I am dealing with this issue big-time! As matter of fact I spoke with my Neurologist yesterday about reducing my meds. He said “it’s as if you are addicted to Morphine, you will suffer coming off” He went on to advise me to go very slowly. My feeling is that all healing is Soul-based but we live in the body and vibrate on a physical level. Your body is like a teenager living at home, getting most it’s needs met with meds. You have to work the Recipe to get the body ready to support itself, ( ie activate the Dopamine faucet!). I could explain further but I’m tired and I must use my time wisely and do my Qi Gong and meditate, then medicate! Good luck to you all! I love you all and me too!